What time is it? It’s Origin Game Time! That’s probably not a celebration you’ve observed before – but go with it, and you can be playing the most exciting shooter EA has paid for in yonks all weekend. If you don’t believe us then just read our Titanfall review. Game Time is a new program Origin are planning to run on the regular. This one resembles your bog standard Steam Free Weekend, but each will be different: a new game assigned a different length of time. They’ll pop up on Origin’s free games page, alongside theirOn the House deals. 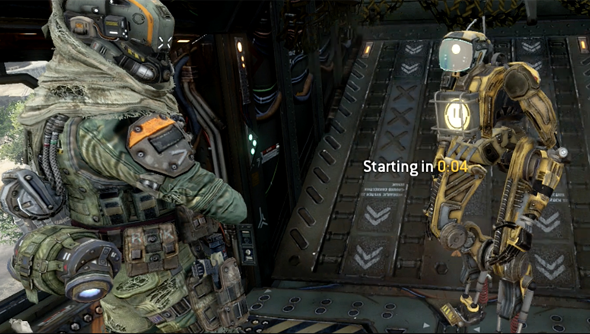 Today’s will span the weekend, “for two days straight”, and unlock Titanfall in its entirety. Should you decide to buy the game afterwards, you’ll find your in-game progress has been saved. Which is nice, because pre-level 5 Titanfall is a little limited without custom loadouts or burn cards. You might find that the deal hasn’t dropped just yet, though. That’s because, at the time of writing, Origin are in the process of rolling out Game Time across their various regions. If it’s not currently visible in your territory, it will be within the next several hours. It’s inevitably going to be a good time to drill your wall-jumping – the matchmaking page usually thick with post-level 50 prestige players will be diluted with plenty of new pilots. Are you in?